Each frame is .1 seconds apart. Michael Phelps' time was a world record 1:53.93. Frame #1: Entry is about to be made with the hands head-width apart. A big kick commences. The major role of the kick at this stage should be to counterbalance the downward vertical force component of the entry. The body is flat. Frame #2: Arm entry is made with hands everted. The kick occurs, the hips rise, and the head drops deeper. This suggests the kick is too vigorous. Not only does the kick counterbalance the entry but also its excessive force causes a pike position at the hips. Frame #3: The hands are rotated inward from their excessive eversion to about 45 degrees. The role of the hands at this time is to prevent any further diving action of the head and shoulders. The arms are moving wider to attain a position that will facilitate a strong pull. The full effect of the kick on producing a pike position can be seen. Frame #4: The upper arms medially rotate and the elbows flex. At this stage the major force component from the arm action is vertical and serves to elevate the head and shoulders. Another action that results from that vertical force component is the hips start to sink and the feet rise. To accomplish all those actions, the extent of the arm force has to be quite large. Frame #5: The vertical force production is very evident. Upper arm abduction produces the majority of the force. Further bending at the elbows also increases the power of this action. The reactions of the head, shoulders, hips and legs to the arm force continue. Frame #6: Vertical forces still emanate from the arm actions but are near the extent of their usefulness. The head is at the surface. The knees begin to bend preparatory to kicking. Frame #7: Propulsive forces are now produced by the rapid adduction of the upper arms. The propulsive surface is the forearm and hand of both arms. Further bending at the knees causes the shoulder to knees line to be inclined. Frame #8: Arm propulsion continues. Adduction of the upper arms is near completion. The leg kick commences. The head is still above the water surface. Frame #9: Rapid elbow extension continues powerful propulsion. At this stage, the limit of propulsion is achieved and the hands/arms will "round-out" and upward to initiate recovery. The legs kick to support the hips being held level with the shoulders and to counterbalance vertical force components of the recovery. Frame #10: The kick is completed as the hands leave the water. The torso, hips, and legs are streamlined. The head is still out of the water. Frame #11: As recovery continues and the head remains high, the body-to-feet streamline is maintained. Frame #12: The head finally returns to the water. The speed with which it returns is high and will require some extensive kicking to counterbalance its vertical force component. The head has been above water since frame #7; a period of half a second. Frame #13: The position in frame #1 is assumed again. Michael Phelps has achieved some remarkable times in his butterfly events. 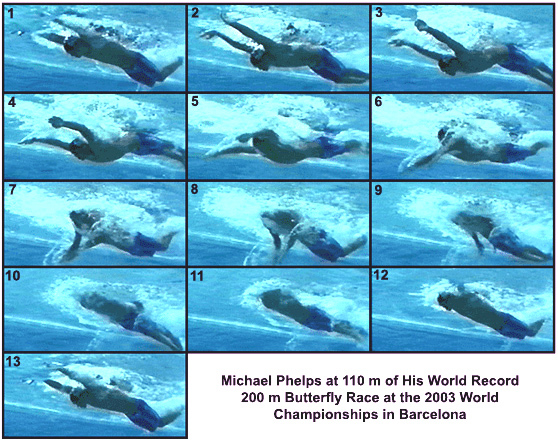 However, this analysis has revealed some possible improvements that would make his swimming even faster. The diving of the head and elevation of the hips should be reduced. At this time, they are too extensive and unproductive. That alteration would allow more of the arm action to be propulsive rather than vertical. One way to reduce this excessive movement would be to reduce the time the head is out of the water. It is possible that this one change could set off a chain of events that will markedly increase the efficiency of energy use and propulsion production. A good feature of Michael Phelps stroke is the streamline (flatness) maintained during recovery. At that stage of the stroke, no propulsion is developed and so this streamline minimizes drag resistance.